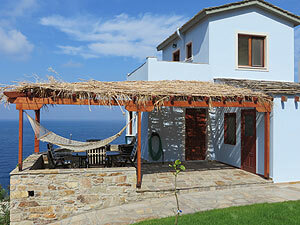 Lefkada House - Ikaria. Book a Villa or House Direct with the Owner and Save. Villa Lefkada Springs is a refurbished traditional Ikarian village estate house located in the village of Thermos Lefkada, near the capital and central port of Agios Kirikos and just 1km from the Lefkada Natural Hot Springs. The spacious and comfortable house consists of 5 Bedrooms with 2 Baths, Living Room, Kitchen, and large outdoor veranda/terrace area with gardens. 8-10 persons can be accommodated and the house also features an outdoor Bar-B-Que & cooking area, TV, washing machine, WIFI and private parking. The house has been carefully restored using only local & natural materials such as stone, wood and plaster. The decor and furnishings are traditional Ikarian with many objects of historical and cultural importance. The outside courtyard is a green oasis, cool, quiet, spacious and shaded.